Boil eggs and remove the shells. Make small cuts on the eggs with a knife. 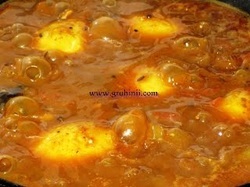 Heat 3 table spoons of oil in a pan and fry the boiled eggs in a medium flame until golden color carefully. Take them into a bowl and keep aside. Wash and soak tamarind in warm water for 10 to 15 mins. and make thick pulp and keep it aside. Now in the same Oil add rai, jeera and urad dal. When rai starts spluttering add finely chopped onions, green chillies, red chillies, curry leaves and garlic pods. Fry in a medium flame until the onions turn pink. Now add red chilli powder, dhaniya powder and haldi. 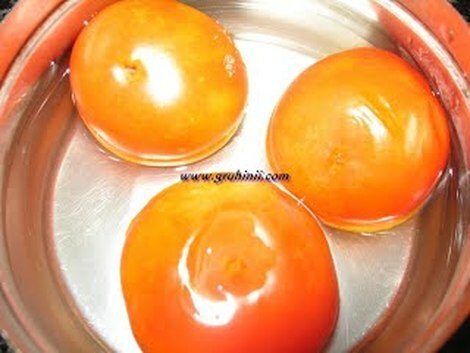 Fry for few seconds and add chopped tomatoes. Add salt and cook until the tomatoes start leaving oil. 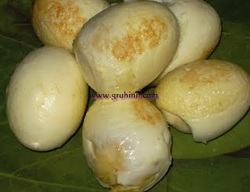 Now add the tamarind pulp and some water (2 cups approx) and boil for 5 mins. 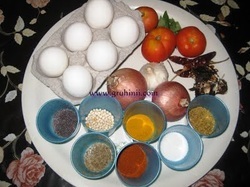 Now add the eggs and methi-jeera powder and boil until the gravy thickens.